Phuket, Thailand. 7th October 2016. 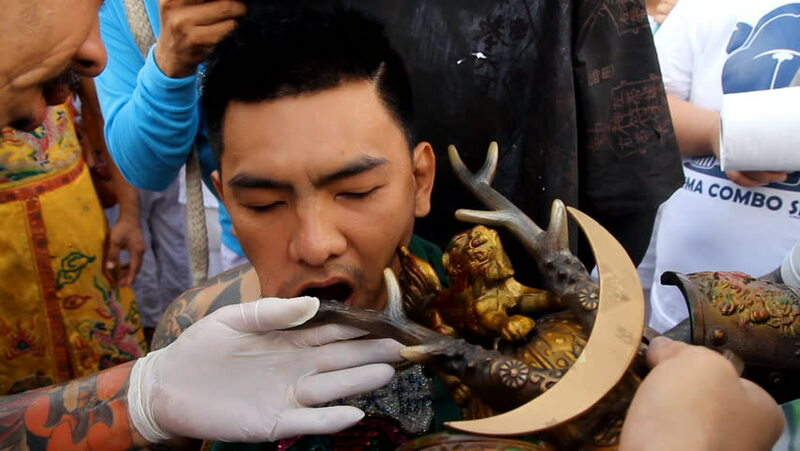 A follower of the Chinese Jui Tui Shrine, pierces his cheeks with Helmet during a procession in Phuket Vegetarian Festival. sd00:12DALIAN, CHINA - FEBRUARY 09, 1999: Out door fruit market, seller helps woman put fruit in a bag. hd00:16KRAKOW, POLAND - JUNE 6, 2015: People make a tattoos at the 10-th International Tattoo Convention in the Congress-EXPO Center. This year anniversary TattooFest is tattoo Studio with an area of 2000m2. hd00:21Kota Bharu, Malaysia -June 17th, 2018 : The family ate the food while visiting their relatives during Eid al-Fitr celebration .Family, Happiness and Forgiveness Concept. hd00:17A woman dyes the hair of adolescent girl. Girl gets a new look.